Occasionally, the morning after the night before, I spy a suspect trail of cast-of clothing wimbling up the hill. A shoe here, a sock there, a bra draped across a litterbin over there. 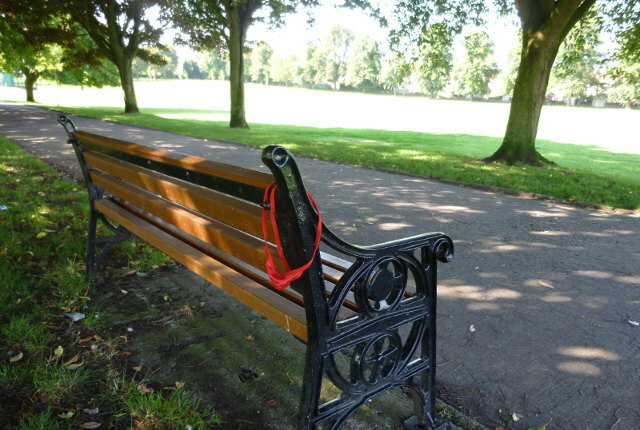 This week, no such riches, just a single crimson thong adorning the corner of a park bench. But what happened to the person wearing it? When did they realise they’d come home without it? How did they explain or hide the loss of their underwear (and possibly their dignity too) from their nearest and dearest? This entry was posted in Writing prompts and tagged inspiration for writers, story ideas, writing inspiration by Judy. Bookmark the permalink.